Airing in N.A. 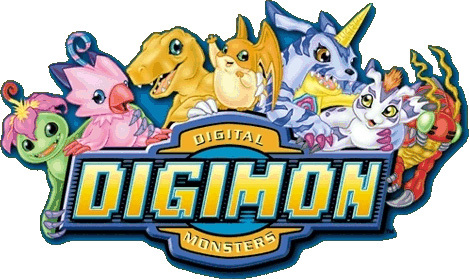 just after the novelty of Pokemon passed, Digimon was the next Anime novelty I got into as a child. Digimon took the leveling-up aspect of Pokemon, tweaked it a bit, and then placed them with their human masters in a parallel world resembling an MMO-kind of realm; The Digimon are the Pokemon of Digimon, but unlike in Pokemon each “Trainer” (called “Digi-destined” in the dub and “Chosen Child” in the original) in Digimon is partnered with only one Digimon. Whereas Pokemon Trainers face off against other Trainers, the Chosen Children use their “Digivices” to help their Digimon fight off “Virus-type” Digimon trying to bring ill will to the Digital World (and sometimes the Earth as well). The very first Digimon series was Adventure, and arguably it remains the franchise’s most popular. While the franchise hasn’t (yet) made the kind of come-back that Pokemon has, I was still equally surprised to see that Digimon is still going for the most part; it’s actually pretty popular within the deviantART community, I’ve noticed.